Most of the parts came from a keg kit I bought from someone on craigs list, I added a tire valve from autozone, and some tubing clamps and air quick releases came from Home depot. 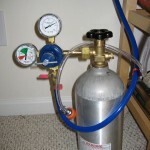 On the left is a 5 lb CO2 cylinder, dual head regulator, and the home home made soda cap. The soda cap is made up of bottle cap I drilled a hole in then mounted a car tire valve, then 1/4 inch tubing to an air quick release valve. 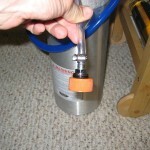 The third photo shows the quick release that came from the air compressor section of home depot. I have some flavoring on order from flavrz, if they don’t work, Soda stream has from concentrate called MyWater that I can try. If i get bored with soda, I can always build my kegerator and bar in the basement. 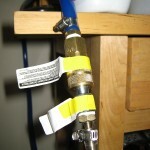 I already have the keg tap and a beer tap, so I just need something the keep the beer chilled and build a bar.